The American flag flies at a welcoming ceremony for U.S. President Donald Trump hosted by Chinese President Xi Jinping in Beijing, November 9, 2017. It is hard to say that the Trump Administration’s characterization of China—in relation to the United States’ pursuit of its power and status in the world—is qualitatively different from those in the National Security Strategy (NSS) papers put out under previous presidents. Ever since the mid/late 1990s, when talk of ‘China’s rise’ started to gain popularity, the central question American security studies—both in policymaking and in academic research—is how to manage the trajectory of China’s future change because it comes at a cost to America’s greatness and poses a threat to its future status. The last time in recent memory when China was named a “competitor,” in President George W. Bush’s NSS report, Chinese think tanks were sent to travel across the American continent in order to gain a feeling for the pulse of the challenge to come. Across the board, as it turned out, American determination to make China pay up or take China to task waned as Chinese delegations moved westward from Washington, D.C. Whether or not a broad spectrum of American sentiment toward China has changed significantly—to the degree commensurate with the tenor conveyed in the wording in Trump’s NSS—is beyond the point. Clearly, the Trump team has chosen to stay true to its campaign rhetoric in executing its China policy. In a sense, another fact-finding trip across the United States is not as necessary. After all, it is the federal government in Washington D.C. that makes foreign policy on behalf of the entire country and the White House is the principal foreign policy decision maker. In the Trump NSS, statements like “America is coming back, and America is coming back strong” sound baffling. Very much like declarations made by the Obama Administration about United States in the Asia Pacific, was there convincing evidence that the United States actually withdrew from anywhere? Even if without the end of defense sequester, or a $700 billion hike in defense spending, is there ever a real prospect for the U.S. military to lose to any opponent? By and large, the sense of insecurity comes from within the United States politicking machinery. One seeming difference in the Trump NSS paper from previous ones is its emphasis on American sovereignty. Even on this point, there is not much that is new. Take the WTO as an example: When the United States is not ready to agree on an issue, there is no way for the WTO process to proceed, from the failure to materialize a ministerial meeting in Seattle, in November 1999, to the failure to make a breakthrough at another such meeting in Buenos Aires in November 2017. Make no mistake about it: It’s either the American way, or no way at all. And, yes, that goes for the international stage, too. Coming back to ties between China and the United States, a full year of the Trump presidency has made one point clear: Forces of introspection have to come from within, in either country. As has been true of the past two decades under continuously heated rhetoric of strategic competition, the two governments and societies are each well stocked with a strong propensity for introspection. The real competition between the two countries’ political and diplomatic establishments is how they manage the spillover effect from the bilateral race to third countries and regions of the world. At present, both China and the United States are equipped with a determination to win the hearts and minds of the larger world. But realization of that wish requires true goodwill, not just rhetoric. There is no free lunch out there, no matter how powerful a government or how it projects its mission. Poverty of concept is one problem, the gap between the plan on paper and apparent policies in the real world is another. The two Obama NSS documents (2010 and 2015) outlined a general view of China as a potential “responsible stakeholder,” a partner, a rising power whom the USA had no inherent reason to fear specifically—though strategic concerns relating particularly to North Korea, the South China Sea, and trade were noted. For better or worse, these had a reasonable relationship to the policies of the Obama years. “China” and “Russia” (not the real entities, but their place-holders in the document) are treated as twin “revisionist powers.” It is a neutral way of describing rising powers as necessarily bent on displacing, defeating, impoverishing, or otherwise marginalizing the top powers. Exactly how or why the security and prosperity of the American people requires a unipolar system is not explained. America achieved its unprecedented wealth and power when in opposition to the Soviet Union, so historians will wonder why a unipolar and not a bipolar or tripolar system creates greater well-being for Americans. Indeed, the 19 countries that outrank the U.S. in per capita wealth have virtually no power or influence in the wide world. The “revisionist” strategic model is really one relating to the projection of American military power, not to the security of the American people. More to the point, what is really “revisionist” about the apparent ambitions of the real China and the real Russia, as contrasted to other countries approaching them in the also-ran league of the world power sprint in which America leaves everybody else in the dust? India’s recent economic problems have cramped its military building, but its ambitions to be “revisionist” in Asia are serious. Trump’s abdication of global leadership and coolness toward NATO creates conditions for a rise in Germany’s already formidable power. Japan is encouraged by American policy to expand its military spending, if possible. Why Russia and China should be uniquely condemned as revisionist, while the report welcomes additional militarism almost everywhere else, is not adequately explained. That said, it seems clear enough that Xi Jinping’s views of China’s international views are in fact post-American—that is to say, post-revisionist—something neglected in Trump’s periodic fawning on the Chinese leader. But Russia has adopted a unique approach of holding its own military line against the U.S. while subverting the capacity of the American government to conduct true strategic resistance, whether economic (as with sanctions) or military (as in Syria). Neither accords with the fantasy world of Trump’s NSS, in which both play the role of determined revisionists who must be sternly kept in their place by a gigantic American military apparatus. 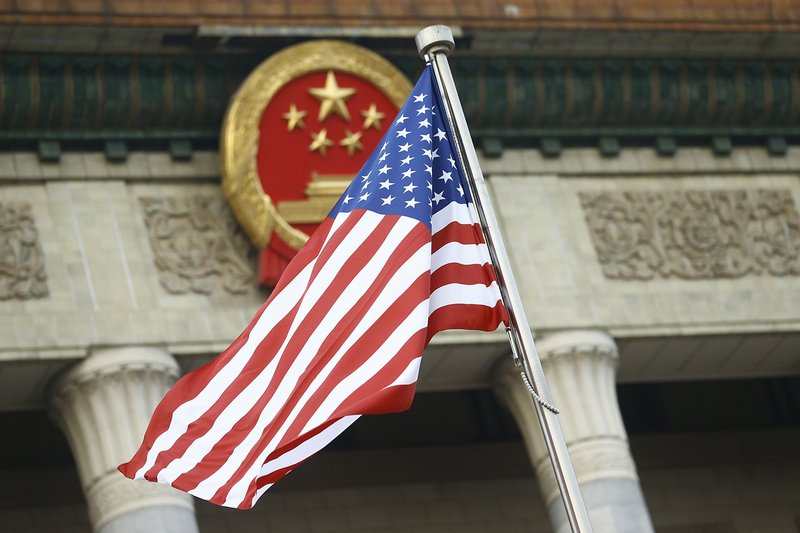 The Trump administration’s newly published National Security Strategy (NSS) does a better job of identifying the various manifestations and observable symptoms of the challenge posed by China than at diagnosing its underlying causes. The NSS is correct to describe China as an “adversary,” a “competitor,” and a “rival” that exploits and distorts existing economic rules and institutions, steals intellectual property and personal data on a massive scale, engages in coercive campaigns against its neighbors, is building anti-access/area denial capabilities targeted against American bases and forward-deployed forces, and seeks ultimately to “displace the United States in the Indo-Pacific . . . and reorder the region in its favor.” Where the document falls short is in explaining exactly why China’s rulers behave in the ways that they do and in drawing the necessary conclusions for U.S. strategy. But China is not just another “revisionist power” playing the age-old game of power politics. It is ruled by a brutal, modern, one-party authoritarian dictatorship that claims the right to regulate every aspect of political, social, and economic life and denies its people the ability to speak, assemble, and worship as they see fit. Most of the things that make China a problem for the United States and its democratic allies follow from these facts. Lacking the legitimacy that comes from the freely given consent of its citizens, the Chinese Communist Party (C.C.P.) regime resorts to a militant form of nationalist ideology that blames foreigners for the nation’s troubles, past and present, and casts the C.C.P. as the irreplaceable defender of its interests and honor. While they may not seek war, China’s rulers need enemies, and a measure of international tension, to mobilize their people and justify their grip on political power. The regime’s mercantilism, and its attempted use of “United Front tactics” to penetrate and influence politics in open societies, reflect its Marxist-Leninist heritage. China’s pursuit of regional preponderance is driven partly by its desire to achieve “the great rejuvenation of the Chinese nation,” but also by the perceived necessity of pushing back the subversive presence of the United States and neutralizing its alliances with Asia’s democracies. Beyond Asia, Beijing seeks to weaken global institutions rooted in liberal democratic values, to spread its own model of development without political reform, and, in general, to make the world safe for authoritarianism. Like it or not, the competition between the United States and China is not just about power and wealth, it is also about ideals. The national security survey issued by the POTUS reflects an attempt by members of the national security apparatus to protect American interests while courting the POTUS, playing to Trump’s ideological presuppositions. The document calls for America and its allies to join together against revisionist China and Russia and rogue nations Iran and North Korea. But Trump had already so alienated Europe, and America’s prestige has so declined there, that even a visit by Trump to the U.K. is sensitive and controversial. That is, Trump’s actual crude and narcissistic behaviors undermine the strategic wishes of the new document. What Trump’s actual policies to China will be remains unclear. In his campaign, Trump promised to roll back Chinese expansionism. How? He promises to defend America against the economic policies of the People’s Republic of China’s neo-mercantilist state. How? He hopes to get China and Russia to cooperate with America against Pyongyang while mobilizing the world against Russia and China. How? I often criticized the Obama administration for its narrow focus on cooperation with China and failure to condemn strongly enough Beijing’s actions in its maritime disputes, which I viewed as revisionist and contrary to U.S. interests. However, the new Trump National Security Strategy (NSS) swings so far to an extreme, it eliminates the strategic foundation for managing China’s rise peacefully. Specifically, there are three problematic aspects of the strategy that will hurt U.S. ability to protect its interests in the long run. First, the NSS clearly labels China a revisionist power and puts it in the same category as Russia, even though the two countries’ behavior, effectiveness, and motivations are quite different. Moreover, the term revisionist is too vague to be useful. My sense is that China is considered revisionist because “they are contesting our geopolitical advantages and trying to change the international order in their favor.” But the U.S. position has always been that the important thing is how China pursues its interests—not expecting China not to pursue those interests. So, Chinese behavior in its territorial disputes is an area worthy of such criticism, but China is not trying to change every aspect of the international order. Some, like the human rights regime, China largely ignores; others, like development banks, China supplements with its own international institutions. China also actively participates, supports, and exploits certain regimes like the United Nations or the World Trade Organization. I would argue that only in the case of U.S. military role in Asia is China actively trying to weaken and undermine the current U.S. position. Second, the NSS argues that China is attempting to erode American security and prosperity. Undoubtedly, some Chinese policies challenge American power, influence, and interests, but it is inaccurate to say a primary driver of Chinese strategy is the desire to undermine U.S. security and prosperity. It may seem like a semantic difference, but it is more accurate to say China is pursuing its own national interests, which at times come into conflict with those of the U.S. In other words, I don’t see a key tenet of Chinese foreign policy being the undermining the U.S. for its own sake, and definitely not on the global scale depicted in the NSS. Lastly, and perhaps most dangerous, the NSS basically states that the nature of the Chinese system, not necessarily how it behaves, makes it a potential enemy of the United States. What do we gain strategically from stating, “these are fundamentally political contests between those who favor repressive systems and those who favor free societies”? Tying the threat to the political system is dangerous, because this is something that is unlikely to change and that we cannot shape. Furthermore, China’s biggest fear is that the United States will not accommodate its newfound position no matter how it wields that power because of the nature of its domestic political system. If this belief gains traction in Beijing, that the United States could never accept a powerful China, then China has fewer incentives to behave responsibility. Moreover, while Chinese policies may support authoritarian governments (those in glass houses. . .) it is inaccurate to argue that China is spreading its authoritarian system. China is not an ideological power, and we should not encourage it to become one. The United States, on the other hand, has always had a foreign policy partly driven by its desire to shape the world in its image. That the NSS references “values” 33 times is a testament to this fact. In short, the U.S.-China relationship is complicated. There are some areas where cooperation is warranted; others confrontation. Inaccurately describing and oversimplifying the situation does not create the sound foundation for national security strategy that is needed. For the first time, the Trump Administration is trying to engage European countries on China. This is an unusual move, quite different from the slightly condescending and very discreet involvement of the Europeans at the time of what was then called the “Asian pivot” by the Obama Administration. In the NSS, it is said that “China is gaining a strategic foothold in Europe by expanding its unfair trade practices and investing in key industries, sensitive technologies, and infrastructure,” a view that is probably shared by many European governments. Whether they can implement sanctions in the European Union framework is another question (As for the United Kingdom, treated in the NSS as a stand-alone European country, we are still waiting to see what its China policy will be like). Interestingly, the United States says it will work with the European Union, and bilaterally with the U.K. and other states, to ensure fair and reciprocal trade practices and eliminate barriers to growth. In addition, it will work with “allies and partners to diversify European energy sources to ensure their energy security.” It sounds familiar to anybody who has studied China’s increased interest in European energy facilities such as Portugal’s National Grid (of which it owns 26 percent) or the U.K.’s Hinckley Point Nuclear project, partly financed by China. Both investments have led to public debates within these countries and outside as far as China’s involvement in the energy supply of these nations. Last, but not least, it is interesting to notice Washington’s interest in coordinating with Europeans on Chinese direct foreign investments. Both the U.S. and E.U. have been talking to China about bilateral investment agreements (without much success); both the U.S. and E.U. are looking for ways to screen FDI, especially in high-tech and key-infrastructures. Whether the two sides of the Atlantic can agree on a joint approach is another matter, although it should be seen as a new way from the Trump Administration to address, along with some of its main “allies,” one of the key issues of its own agenda: trade. The National Security Strategy (NSS) is the first document that presents the Trump Administration’s overarching China strategy, describing how it views China and what it plans to do. Identifying China as a “strategic competitor,” whose “economic aggression” needs to be countered by tougher U.S. policies, this document predicts a gloomy future for U.S.-China relations dominated by destructive trade disputes. The statements “economic security is national security” and “an America that is safe, prosperous, and free at home is an America with the strength, confidence, and will to lead abroad” are valid. However, the mindset behind the NSS, its “principled realism,” has fundamental flaws. It is a realism that overemphasizes short-term outcomes that have a direct impact on a clear majority of U.S. citizens. It assesses the global power balance between the U.S. and China with an overwhelming focus on trade and economics, which are easily measured by assessing the trade deficit and the employment rate. Other crucial national security issues—climate change and cybersecurity, for instance—demand the hard work of diplomacy, negotiation, and cooperation with foreign stakeholders, including non-allies. While the work can be long and painful, the outcomes are difficult to quantify and enjoy or even locate inside one’s own national borders. Regarding these issues, the Trump Administration simply gives up opportunities to nurture partnership with China, as evidenced by the U.S.’s withdrawal from the Paris Agreement. And then the U.S. also counts on other states to change their attitudes towards China without backing them up. While accusing China of trying to “expand influence and gain competitive advantages” through vast investments in the developing world, the U.S. turns inward, cuts funds to the United Nations Population Fund, and quits the United Nations Scientific and Cultural Organization. Not to mention that the U.S. has ignored the strategic importance of Africa for too long and reduced aid and investment in Latin America in recent years. If this “principled realism” continues to guide American policies, great power conflicts may be unavoidable. Trump’s voters, who are happy to see his return to his campaign promises, will suffer the catastrophic consequences of future conflicts along with the broader population around the world. Of course, it takes two to tango and, in this case, it also takes two to fall into a Thucydides Trap. Unfortunately, the likely response to Trump’s NSS from China will be condemnation of the U.S. rather than an alteration of its trade practices and assertive foreign policies. The congressionally mandated National Security Strategy (NSS) is typically boilerplate, a cataloguing of general U.S. foreign policy interests and objectives interspersed with bromides to America’s unique role in the world. This is not so for the 2017 iteration, which attempts to lend an intellectual backbone to President Trump’s muddled, often contradictory, worldview. The 2017 NSS asserts that the U.S. is engaged in a contest on the side of “those who favor free societies” against “those who favor repressive systems.” In this struggle, the U.S. is challenged by three sets of actors: the revisionist powers China and Russia; the rogue states Iran and North Korea; and the transnational threat groups. The Trump administration cites “principled realism” as its guiding strategic doctrine for addressing these challenges. Putting aside the clumsy application of a narrative of a bipolar struggle to a complex, interconnected, multipolar world, the NSS gives short shrift to both U.S. principles and realism. This is evident in its treatment of China. Notwithstanding occasional paeans to contesting oppression, the NSS largely omits normative reasons for the U.S., or its democratic allies, to meet the China challenge. It refrains from explicitly criticizing China for eroding international norms the U.S. espouses, at least in word if not always in deed, such as human rights, rule of law, and an open Internet. Rather, China is deemed a threat because it seeks to dislodge the U.S. from the Indo-Pacific, shift the regional balance of power, and increase its own power at the expense of other states’ sovereignty. Consequently, the U.S.-China contest is reduced to one powerful state with its particular value system threatening another power and its particular values; more akin to Habsburgs versus Bourbons than the ideological contests of the 20th century. This is a marked departure from the traditional U.S. approach, which has been to assert that its liberal values hold universal appeal. This has provided the U.S. with a soft power advantage over authoritarian rivals such as China, whose international influence is inherently limited by political ideologies grounded in nationalism that are particular to one nationality or ethnicity, and consequently have little global appeal (e.g. Chinese nationalism is not exportable to Russia and vice versa). Despite, or perhaps because of, its oxymoronic doctrine of “principled realism,” the NSS also neglects basic realist logic. It is never in the interest of one power to face off against a coalition comprised of its two strongest peer or near-peer competitors. However, throughout the NSS, China and Russia are lumped together as fellow “revisionist powers,” and often cited as contributors to the same problems, such as undermining U.S. influence through unfair economic practices. Outside their respective Asian and European regional contexts, China and Russia are hardly ever mentioned in their own right. Despite their differences, Xi Jinping and Vladimir Putin are effective enough at fostering the impression that China and Russia are staunch allies against what they portray to domestic audiences as an imperialistic and implacable America bent on destabilizing the world to further its own interests. Now they have Trump’s help.